Signature : Tanba Kami Fujiwara Terukado. This sword belongs to Jyo Jyo saki ranking. 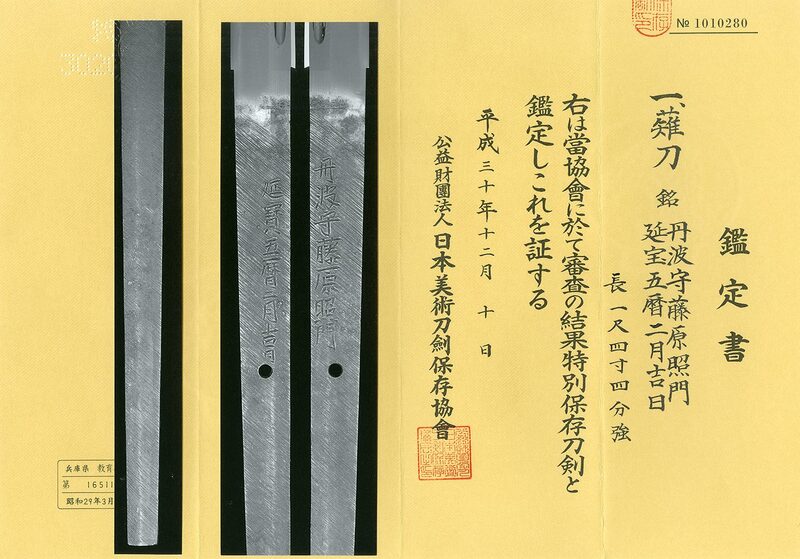 The blade was polished　by high ranking polisher. Blade length :　44.2　cm or 17.4inches. Sori : 4.09cm or 1.61 inches. Width at the hamachi : 2.95cm or 1.16 inches. Kasane : 0.82cm or 0.323inches. Era : Edo period Enpo era. Shape : The blade is wide and thick gorgeous Naginata. with jinie attach and chikei work along with massage had. and then gunome midair work double hamon. Inside of the Hamon, sunaagshi and Kinsuji scatter. Noshu Seki Zenjyo school and made swords at Seisyu Kuwana and Edo. lucky day which is very precious data. well and also Chikei. Hamon also well worked. We recommend this nice sword for you.